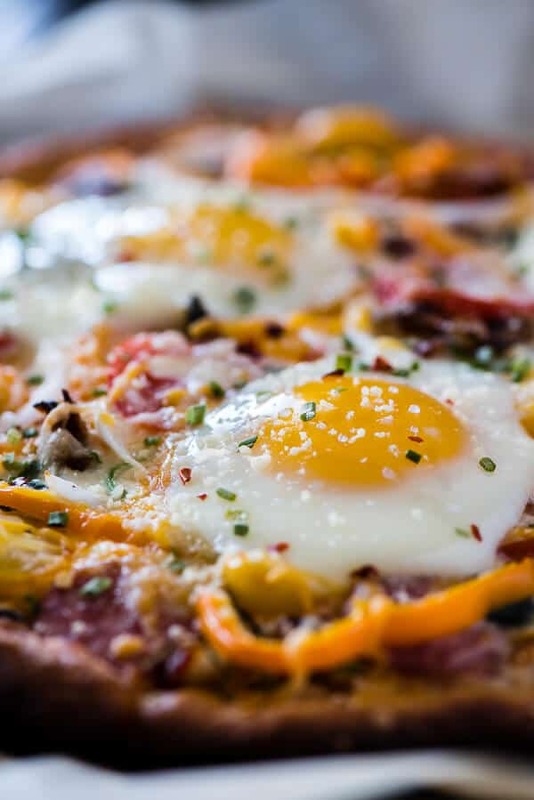 Pizza for breakfast doesn’t have to mean cold leftovers – this easy 30-minute Supreme Breakfast Pizza recipe is built on a buttery crescent crust and is loaded with anything and everything your hungry morning belly can imagine! You know what? I freaking LOVE pizza. Like a pure, disgusting, unabashed kind of love. Wanna know what I eat when I’m feeling too lazy to cook? Pizza. Too undecided on where to go? Pizza. I think you get the idea. But yeah, no matter what time it is, pizza is always a good idea. It’s got almost all the major food groups, so even though it’s heavy on the carbs, you’re getting some good stuff in there, too. 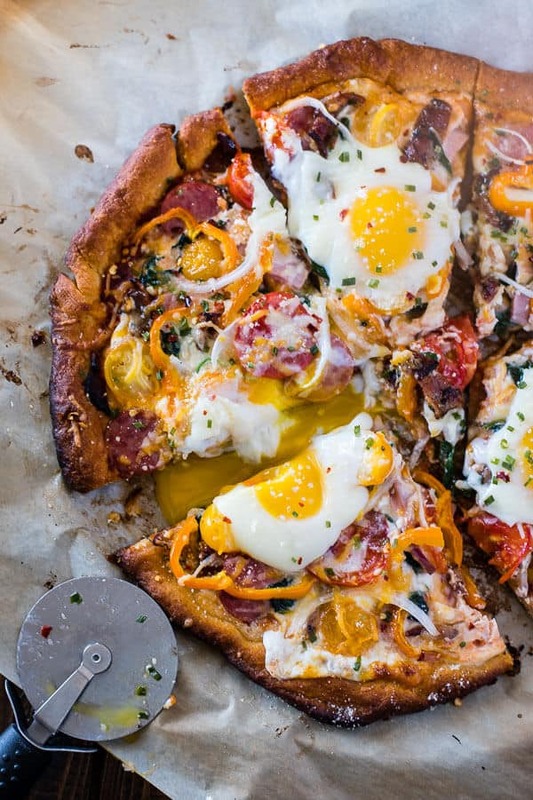 And as far as breakfast pizza goes, well…it’s like Beyoncé says. If you like it then you shoulda put an egg on it. Or something like that. 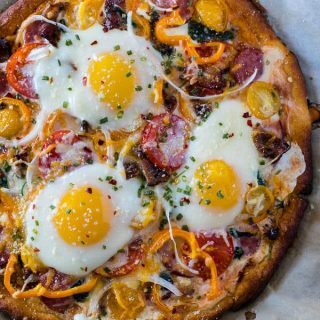 This Supreme Breakfast Pizza is BOSS. I think I’ve covered pizza pretty well in the last couple of years, but there’s just something about this one that makes my heart do special pitter-patters. Maybe it’s the crescent roll crust. Have I ever talked about how much I love crescent rolls? Oof. Best lazy morning breakfast ever. So quick, so convenient, and no need to laminate dough to stuff my face with buttery, flaky goodness. Obviously, it was the perfect base for this pizza for all those same reasons. Who wants to mess with pizza dough in the morning while they’re still rubbing sleep from their eyes? Pop the can (scare the dog,) mash them all together until they look sort of like a pizza round, and done. Maybe it’s the fact that it’s a perfect mash-up pizza. Marinara sauce and mozzarella topped with all sorts of ingredients you can find in a breakfast dish. 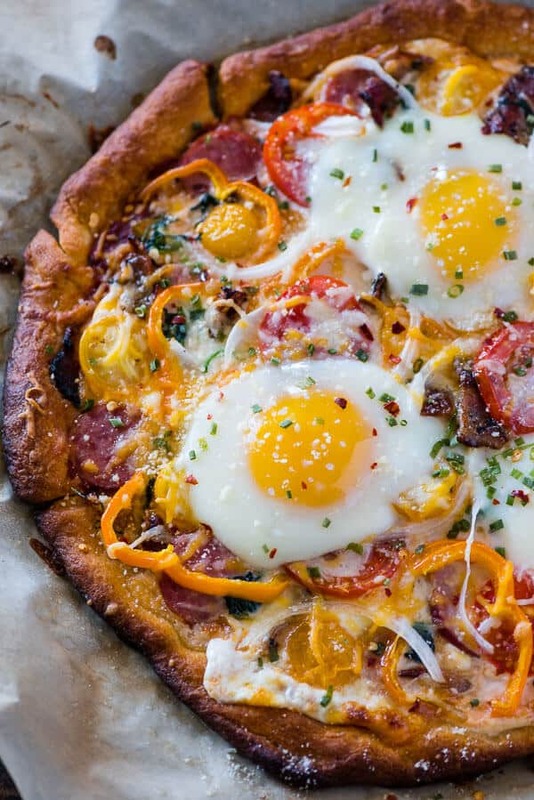 It’s not called the Supreme Breakfast Pizza for nothing! Take away the crust and this would be a quiche. Which is fine, but it’s National Pizza Month, so stick with me. That first bite is taste bud confusion at its finest. Is it breakfast? Is it brunch? Is it midnight? Does it matter? Hardly. Just eat it. I think my favorite part (besides the taste) is how freaking fast this goes from just being ingredients in your fridge to in your mouth. If you’re like me and always have some cooked bacon in the fridge, then this recipe goes even faster. Even with bacon frying time, as long as you’re keeping busy preheating the oven and topping the pizza, you can be enjoying this baby in 30 minutes or less! That’s a promise that those delivery guys can’t even keep most of the time, amirite? Damn, you a pretty pizza. 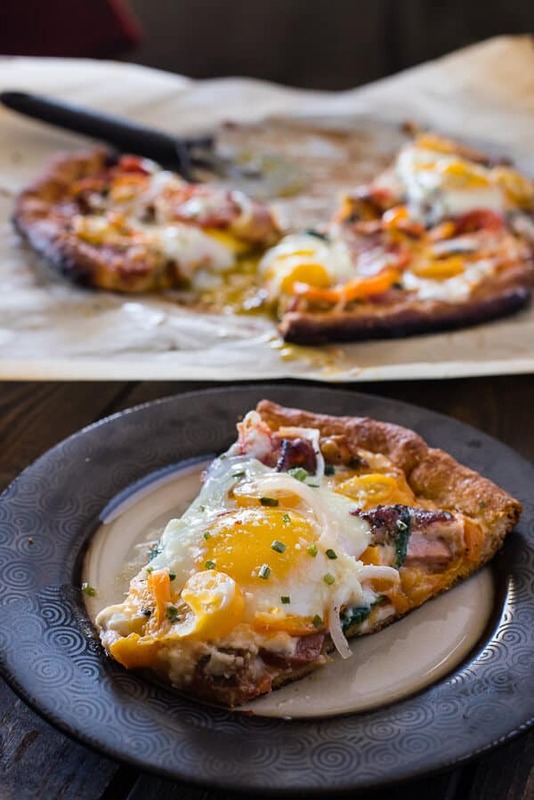 Pizza for breakfast doesn't have to mean cold leftovers - this easy 30-minute Supreme Breakfast Pizza recipe is built on a buttery crescent crust and is loaded with anything and everything your hungry morning belly can imagine! Preheat oven to 425 degrees F. Place a sheet of parchment paper on a pizza pan and sprinkle generously with flour. Open the can of crescents and unroll the dough, placing them on the parchment with triangles facing in. They won't match up into a perfect circle, but maneuver them the best you can. Pinch together the seams to seal, and pinch the outer edge to form a raised edge to hold in the toppings. Carefully spread the sauce over the crust, then place slices of mozzarella on top, followed by colby jack. Arrange toppings evenly on top of cheese. Place pizza pan in preheated oven and bake for 3 minutes, then carefully remove and crack eggs on top of pizza. Return pizza to oven and continue to bake for 10-12 minutes, or until egg whites are set and crust is browned. Remove from oven and brush butter over outer edge of crust. Sprinkle pizza with chopped chives, Parmesan, salt, and pepper flakes to taste. Enjoy! Think you know pizza? Well…you will after checking out all these other delicious pizza recipes! This pizza makes it a good morning for sure! Breakfast pizza has been in the works for a while. Now, I can just make yours! I just hope the hubs doesn’t think I’m off my rocker. Wow, that’s beautiful. 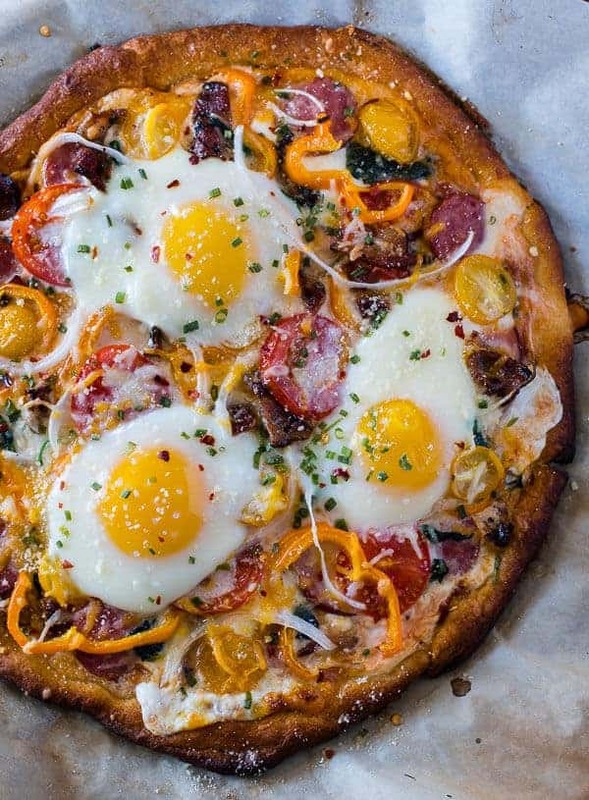 My husband would love this pizza for breakfast! 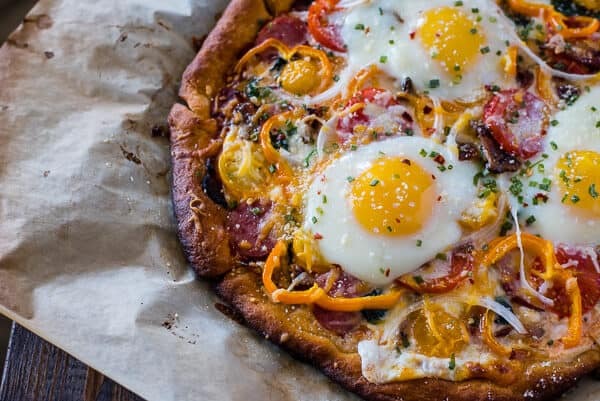 saw this on the front of your site, had to check it out, really impressive recipe, love the fried egg of course, and that it can literally be a breakfast dish or dinner recipe, your choice, thank you for this recipe! OMG I am printing this recipe. What a great idea. Who doesn’t LOVE pizza!! My hubby could eat it EVERY DAY. Now, with this recipe…he can have it for breakfast too. He will be SOOO excited when I show him this!! Looks so good! My two favorite food: breakfast + pizza. I’d like to make this for the brunch this weekend!